My favorite recipes, food, and more! 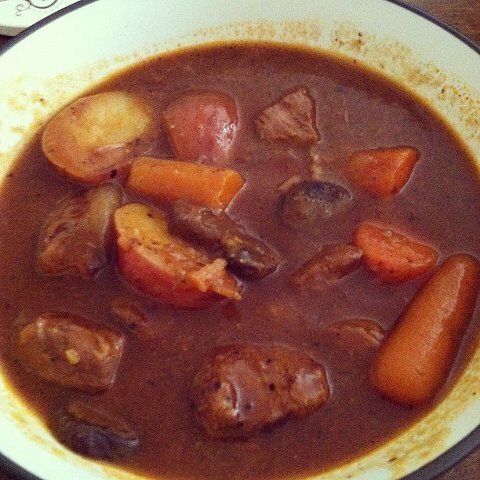 Adapted from Allrecipe’s Irish Beef Stew recipe..
1. Preheat a large dutch oven over medium high heat. Add 2 tablespoons of olive oil. 2. Mix together the flour and rosemary garlic seasoning in a gallon sized storage bag. Put beef into the bag, shake to coat. Brown in two batches, set aside. 3. Add additional 2 tablespoons of oil and add carrots, onion, and garlic. Sauté for 5 minutes, add salt and pepper to taste. Add tomato paste and cook out for one minute, then deglaze the pan with the Guinness and beef broth. Bring to a boil, then reduce to a simmer and add browned beef back in. Cook for 1 hour over low heat. 4. Add potatoes and mushrooms to the pan, simmer for one more hour. 5. Mix together cornstarch and cold water. Add to stew and simmer until thickened. Taste and add more seasoning as needed, serve immediately.